This malignant tumor composed a mixture of the epithelial, mucin-producing, and intermediate cells. this malignancy may occur in all ages, but its prevalence increases in the fourth and fifth decades of life. Neoplastic transformation of entrapped minor salivary glands within the maxilla. The first case of CMECs was reported in the mandible of a 66-year-old woman by Lepp in 1939. This case report presents CMEC with unilocular radiographic feature. Based on our collected data, <10 similar studies from 2010 were published in English. A 47-year-old woman referred to the Department of Oral and Maxillofacial Surgery at Dental School of Isfahan University of Medical Sciences, exhibiting a lesion in the right posterior region of the mandible, which had been present for the previous 4 months. There were lower lip paresthesia and pain in the right ear [Figure 1]a. Figure 1: (a) Extraoral examination showed swelling in the right posterior region of the mandible, (b) intraoral examination revealed that the lesion was covered with intact oral mucosa. In oral examination, a fairly firm mass in the edentulous area on the right posterior region of mandible was seen. The lesion was not wounded with dark or black color and was covered with intact oral mucosa [Figure 1]b. The teeth were not mobile, and on medical history, she is a well-known hypothyroidism patient. In the patient's radiographic examination in the panoramic view, an oral and maxillofacial radiologist reported an ill-defined unilocular radiolucent lesion in the right posterior mandible, and the radiologic report from computed tomography scan showed an ill-defined lytic lesion in the right posterior mandible. There were no bone fractures, and there were some lymph nodes with maximum diameter of 5.5 mm in right submandibular space [Figure 2]. Figure 2: Computed tomography scan showed an ill-defined unilocular radiolucent lesion in the right posterior region of the mandible. With respect to ominous criteria such as lip parasites and ill-defined radiolucency, the malignant odontogenic and nonodontogenic tumors were suggested as differential diagnosis. Incisional biopsy was performed, and microscopic examination revealed MEC. The oromaxillofacial surgeon removed the soft tissue from the retromolar area and bone tissue from the posterior lingual area of the mandible with 1 cm safe margin around the tumoral area. Two pieces of tissue were sent to the Oral Pathology Laboratory. In the gross examination, the diameters of the brown-gray soft tissue sample were 30 mm × 25 mm × 7 mm, and the diameters of other bony pieces from the posterior part of the lower jaw were 40 mm × 12 mm × 12 mm [Figure 3]. 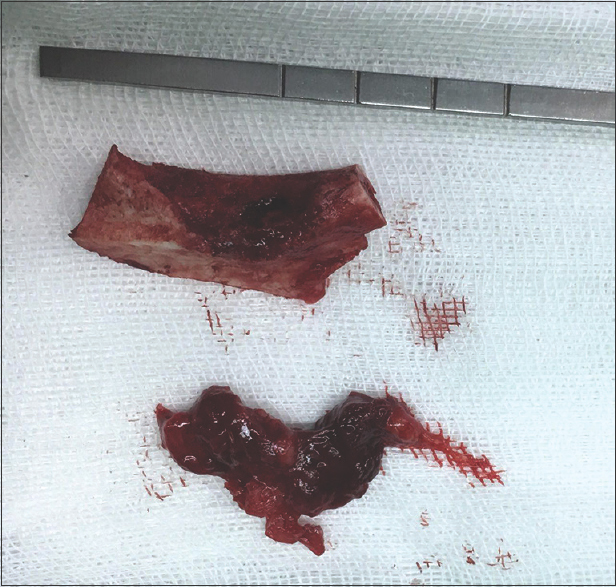 Figure 3: Two pieces of tissue were sent to the Oral Pathology Laboratory, the diameters of the soft tissue sample were 30 mm × 25 mm × 7 mm, and the diameters of other bony pieces from the posterior part of the lower jaw were 40 mm × 12 mm × 12 mm. In microscopic examination, the neoplastic proliferation of mucinous, intermediate, epidermoid, and clear cells was observed in the form of cellular sheets and cystic spaces. Some areas were affected by dysplastic changes, including hyperchromatism and pleomorphism nuclei, especially in the epidermoid and intermediate cells. The ultimate diagnosis was reported to be CMEC [Figure 4]a and [Figure 4]b. 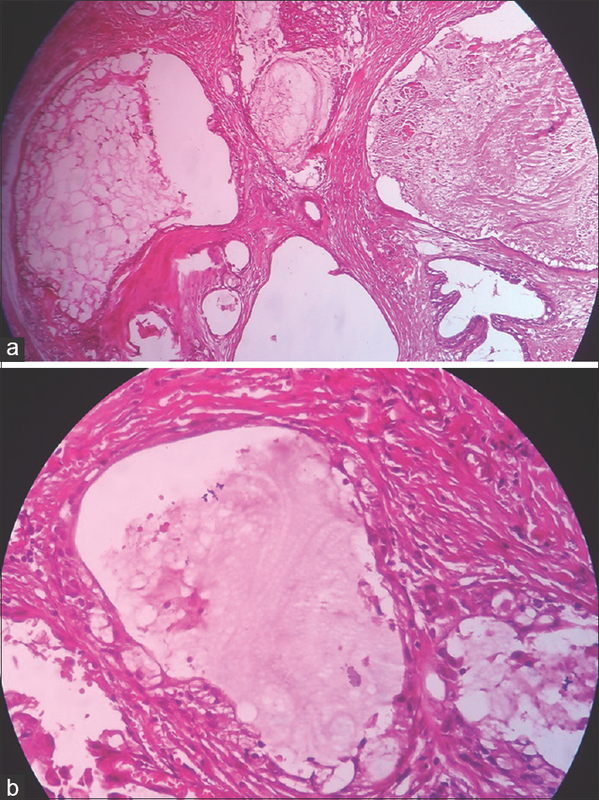 Figure 4: In microscopic examination, the neoplastic proliferation of mucinous, intermediate, epidermoid, and clear cells was observed in the form of cellular sheets and cystic spaces. (a) H and E, ×100, (b) H and E, × 400. After that, the patient underwent adjuvant radiotherapy and chemotherapy. She received 64 Gy of radiation in 33 fractions and ERBITUX (cetuximab) at the same time. Six months after radiotherapy and chemotherapy, there was no evidence of tumor [Figure 5]a and [Figure 5]b. Figure 5: Six-month follow-up after radiotherapy and chemotherapy, there was no evidence of tumor. (a) Intraoral view, (b) radiographical view. CMEC affects women twice more than men, mostly occurring in the fourth and fifth decades of life, and involves the mandible (the molar angle region) twice as much as the maxilla. The main symptoms are swelling and pain, the others such as trismus, paresthesia, and tooth mobility being noted occasionally. However, these symptoms are not always necessarily present. Radiographic features usually appear as unilocular or multilocular radiolucent lesions with sclerotic and well-defined margins. These same characteristics are found in some cystic lesions and tumors with odontogenic origin such as ameloblastoma and keratocystic odontogenic tumor., However, it should not exclude less common, but more serious conditions as metastatic tumors, malignant osseous tumors, primary intraosseous carcinoma, and malignant salivary gland tumors. The present case showed a unilocular radiographic lesion, and for a better comparison, a literature review was conducted in the PubMed database to survey the published case reports of unilocular CMEC after 2010, as described in [Table 1]. It often demonstrated prominent cystic growth and was divided into low-, intermediate-, and high-grade types on the basis of morphological and cytological features. CMEC represented 2%–4% of mucoepidermoid carcinomas. The treatment of CMEC included surgical removed of the tumor and postoperation radiotherapy. More conservative surgical approaches such as curettage, enucleation, and marginal resection of the jaw, with or without postoperative radiation, led to the relapse of lesion in 40% of cases, while the recurrence was seen in 4% of the cases in segmented resection of the mandible. Gradation of the tumor was one of the most important predicting factors for the survival of patients suffering from CMEC. High grade was characterized by larger bone destruction, enlarged frequency of relapses, and presence of regional and distant metastases. CMEC is rare in the jaws; however, since the lesion's behavior is different clinically and radiographically, it is important that the clinician should be aware of the various presentations of a particular disease process and try to achieve the diagnosis accurate and fast. As we observed in this case, a unilocular lesion could be a major concern, and all such lesions should be carefully examined. Surgery such as en bloc resection is the treatment of choice with adjuvant radiotherapy in high-grade cases. Atarbashi Moghadam S, Atarbashi Moghadam F. Intraosseous mucoepidermoid carcinoma: Report of two cases. J Dent (Shiraz) 2014;15:86-90. Sankireddy S, Kaushik A, Vijaychander V, Krishna Ayinampudi B, Koduri S. Intraosseous mucoepidermoid carcinoma of the mandible – A rare case report. Rev Sul Bras Odontol 2014;11:401-4. Waldron CA, Koh ML. Central mucoepidermoid carcinoma of the jaws: Report of four cases with analysis of the literature and discussion of the relationship to mucoepidermoid, sialodontogenic, and glandular odontogenic cysts. J Oral Maxillofac Surg 1990;48:871-7. Waldron CA, Mustoe TA. Primary intraosseous carcinoma of the mandible with probable origin in an odontogenic cyst. Oral Surg Oral Med Oral Pathol 1989;67:716-24. Prabhu S, Rekha K, Kumar G. Glandular odontogenic cyst mimicking central mucoepidermoid carcinoma. J Oral Maxillofac Pathol 2010;14:12-5. Brookstone MS, Huvos AG. Central salivary gland tumors of the maxilla and mandible: A clinicopathologic study of 11 cases with an analysis of the literature. J Oral Maxillofac Surg 1992;50:229-36.
da Silva LP, Serpa MS, da Silva LA, Sobral AP. Central mucoepidermoid carcinoma radiographically mimicking an odontogenic tumor: A case report and literature review. J Oral Maxillofac Pathol 2016;20:518-22. Nagasaki A, Ogawa I, Sato Y, Takeuchi K, Kitagawa M, Ando T, et al. Central mucoepidermoid carcinoma arising from glandular odontogenic cyst confirmed by analysis of MAML2 rearrangement: A case report. Pathol Int 2018;68:31-5. Sruthi S, Sankari R, Ramesh V, Daniel M. Intraosseous mucoepidermoid carcinoma radiographically mimicking a cystic lesion – A case report. Oral health Case Rep 2017;3:2. Aggarwal P, Saxena S. Aggressive growth and neoplastic potential of dentigerous cysts with particular reference to central mucoepidermoid carcinoma. Br J Oral Maxillofac Surg 2011;49:e36-9. Chiu GA, Woodwards RT, Benatar B, Hall R. Mandibular central mucoepidermoid carcinoma with distant metastasis. Int J Oral Maxillofac Surg 2012;41:361-3. Rathore AS, Ahuja P, Chhina S, Ahuja A. Primary intraosseous mucoepidermoid carcinoma of maxilla. J Oral Maxillofac Pathol 2014;18:428-31. Nallamilli SM, Tatapudi R, Reddy RS, Ravikanth M, Rajesh N. Primary intraosseous mucoepidermoid carcinoma of the maxilla. Ghana Med J 2015;49:120-3. Pires FR, Paes de Almeida O, Lopes MA, Elias da Cruz Perez D, Kowalski LP. Central mucoepidermoid carcinoma of the mandible: Report of four cases with long-term follow-up. Int J Oral Maxillofac Surg 2003;32:378-82. He Y, Wang J, Fu HH, Zhang ZY, Zhuang QW. Intraosseous mucoepidermoid carcinoma of jaws: Report of 24 cases. Oral Surg Oral Med Oral Pathol Oral Radiol 2012;114:424-9. Woo HJ, Bai CH, Kim YD, Song SY. Mucoepidermoid carcinoma of the submandibular gland after chemotherapy in a child. Auris Nasus Larynx 2009;36:244-6.